The Amherst Chapter of Alpha Delta Phi was chartered in 1837. In their early days, fraternities rented rooms in dormitories, and Alpha Delt was that first fraternity to acquire its own housing. In 1874, as President King writes, "Alpha Delta Phi purchased the Sellen house on South Pleasant Street...after a destructive fire in the downtown business block" (King, 150). He continues, "Tradition in Amherst says that the Alpha Delt purchase of the Sellen house provided the chapter with the first fraternity-owned building with dormitory facilities for its members in any college in the country." 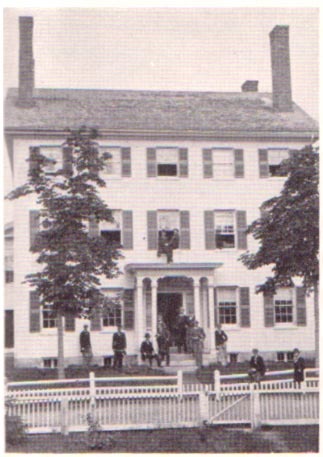 The Sellen house is pictured here in 1878, from a photograph in "The Consecrated Eminence" (King, 160-61).